I’m trying something a bit different. I’ve been so busy with work and other projects that I’ve been neglecting the Puncetto tutorials. Since I’m taking a course in Flash, I decided to try using its vector drawing tools and animation to replace the multiple photographs/drawings that have accompanied the earlier tutorials. Since this is a Flash .fla converted to .mov and uploaded to YouTube, I can’t add controls so that you stop/start the video, other than the ones that YouTube uses, so I recommend that you get used to pausing/playing the video. Otherwise it runs through very quickly. If you find it too fast, I can try to slow down the frame rate in the future. At this point I won’t be making cosmetic changes. It’s done with frame-by-frame animation, by drawing the figure, erasing a bit at a time, and then reversing the frames (a mere 450 frames!). The tail-knot animation was also done frame by frame because shape tweening doesn’t do knots very well. I will, of course, continue to include written instructions so that these can be saved and printed out. Since this is an experiment, I would appreciate feedback! This is not an easy motif but it’s a natural progression from the earlier Squares and Bars tutorial. These little squares are usually worked in groups of four or nine squares. The basic principle is the same. You create the open squares and then finish with the knots around the outside edge. In older patterns you often find these made by the dozen and inserted into a design, tipped on one corner like a diamond. I should tell you that making even squares is tricky because the first knots slide around on the thread. That’s why I included step 4, where you anchor the tail of the thread by tying it down, to keep the knot (#3) from sliding all over the place. Note: The working order of squares is bottom left, bottom right, top left, and top right. Make 3 knots on the loop you just formed, so that you are working up the right side of the bottom left square. Make another knot on the thread tail to form the bottom right square. At this point you will find that the 2 knots on the tail slide around a lot. You will find it much easier to work the rest of the motif if you anchor the thread tail by threading it into a needle and working a knot in the corner. That’s the squiggly tail animation you see at this point. Make 3 knots on the loop you just formed, so that you are working up the right side of the bottom right square. Working from right to left, make 3 knots on the top of the bottom right square, then 3 knots on the top of the bottom left square. Make a knot on the third (middle) loop of the previous row, so that it forms the top left square. Make 3 knots on the loop you just formed, so that you are working up the right side of the top left square. Make another knot on the last loop of the row below, so that it forms the top right square. Make 3 knots on the loop you just formed, so that you are working up the right side of the top right square. Working from right to left, make 3 knots on the top of the top right square, then 3 knots on the top of the top left square. Working from top to bottom, make 3 knots in each square. 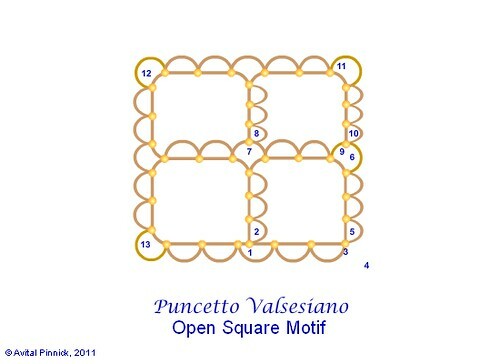 Working from right to left (you will be holding the motif upside-down), make three knots in each square. This entry was posted on January 31, 2011 at 1:52 pm	and is filed under Crafts, Puncetto Valsesiano, tutorial, videos. Tagged: needle lace, needlelace, Puncetto Valsesiano, tutorial. You can follow any responses to this entry through the RSS 2.0 feed. You can leave a response, or trackback from your own site.